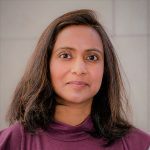 Manimala Kumar is a product manager at Honeywell where she is launching a new connected things platform. Her expertise lies in IoT and artificial intelligence. Her interest in IoT was intrigued at Aclara where she first developed smart grid solutions. Aclara was ranked #2 Meter Data Management provider by Greentech Media. She was a contributor to open source library of NASA. She regularly writes and critiques IoT business and technology topics. She has authored IoT case study at Harvard Business Review and is a reviewer at Emerald Insight. She has an MBA from University of California, Berkeley and is pursuing an M.S. in Computer Science with a specialization in machine learning from Georgia Institute of Technology.